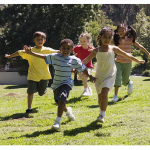 Join us for the Salvation Army #RedKettleReason Twitter Party on Tuesday, November 17th 2015 from 1:00 – 2:00 PM ET! We’ll be getting in the holiday spirit by chatting about the different ways we can give back this year with the Salvation Army and its #RedKettleReason campaign! Prizes: 2 pre-party winners will receive a $50 gift code and 6 party winners will receive a $50 gift code. Pre-Tweet to Win (Within 24 hours of Twitter Party Start Time)! 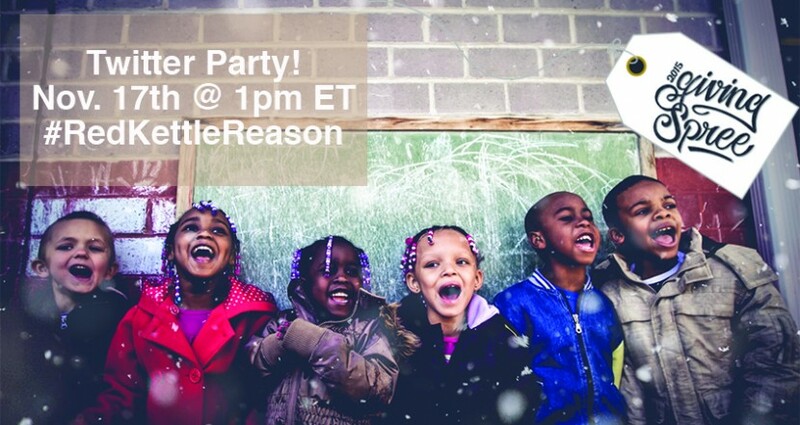 Anyone who tweets this up until the #RedKettleReason Twitter Party will be entered to win one of two $50 gift codes! As parents we try to instill important values in our children by teaching them the importance of giving back and helping those in need, especially during the holiday when we have so much to be thankful for. The Salvation Army, one of the world’s largest and oldest providers of social services, encourages Americans to give back this season with their #RedKettleReason campaign. To learn more, be sure to join the conversation Tuesday, November 17th 2015 from 1-2 PM ET! Easy. Just tweet using the hashtag #RedKettleReason. Mom Central moderators will help guide the conversation with engaging questions and giveaways. The #RedKettleReason Twitter Party features a pre-party giveaway of two (2) promotional items valued at $50.00 each! Please see below for an overview of specific details and go to http://www.momcentral.com/giveaway-rules to be directed to Mom Central’s official Giveaway Rules. • Entry Period: The entry period for the Twitter Party Pre-Party Giveaway begins on November 16, 2015, at 1:00:00 p.m. Eastern Time (ET) and ends on November 17, 2015 at 12:59:00 p.m. ET (the “Entry Period”). • How to Enter: Current Twitter users or those willing to create a Twitter account can enter by following @MomCentral on Twitter and posting a Tweet during the Entry Period with the hashtag #RedKettleReason. Only one (1) Twitter account can be used to enter the Pre-Party Giveaway. • Winner Selection Process: Mom Central will select two (2) winners in a random drawing from all eligible entries during the Entry Period. Odds of being chosen as a selected Winner depend on the total number of entries. The Sponsor will Tweet the names of selected entrants from the Twitter account @MomCentral following the Entry Period on November 17, 2015, between 1:00:00 p.m. ET and 2:00:00 p.m. ET. Each entrant is limited to one (1) prize. The results of the random selection are final and binding. • Winner Prizes and Approximate Retail Values: Each Winner will receive one (1) promotional item, with an approximate retail prize value of $50.00 (the “Winner Prize”) upon being declared a Winner. Mom Central will deliver the Winner Prize to an email address provided by the Winner. The Twitter Party features a giveaway of six (6) promotional items valued at $50.00 each. Please see below for an overview of specific details and go to http://www.momcentral.com/giveaway-rules to be directed to Mom Central’s official Giveaway Rules. • Entry Period: The entry period for the #RedKettleReason Twitter Party Giveaway begins on November 17, 2015, at 1:00:00 p.m. Eastern Time (ET) and ends on November 17, 2015 at 2:00:00 p.m. ET (the “Entry Period”). • How to Enter: Current Twitter users or those willing to create a Twitter account can enter by following @MomCentral on Twitter and posting a Tweet during the Entry Period with the hashtag #RedKettleReason. Only one (1) Twitter account can be used to enter the Party Giveaway. • Winner Selection Process: Mom Central will select six (6) winners in a random drawing from all eligible entries during the Entry Period. Odds of being chosen as a selected Winner depend on the total number of entries. The Sponsor will Tweet the names of selected entrants from the Twitter account @MomCentral following the Entry Period on November 17, 2015, between 1:00:00 p.m. ET and 2:00:00 p.m. ET. Each entrant is limited to one (1) prize. The results of the random selection are final and binding. Winner Prizes and Approximate Retail Values: Each Winner will receive one (1) promotional item, with an approximate retail prize value of $50.00 each (the “Winner Prize”) upon being declared a Winner. Mom Central will deliver the Winner Prize to an address provided by the Winner. Thank you for the invite! and for hosting such a wonderful chat! RSVPed & Tweeted an invite (also posted on fb blog page) see you there!